There are few places in the world where granite boulders meet the beach and sea making for a spectacular coastline. The Seychelles, Virgin Gorda and Brittany’s Rose Coast are several. Pink and black speckled granite is used here for houses, park benches, street markers and about anything requiring stone in this gorgeous section of Brittany’s north coast. 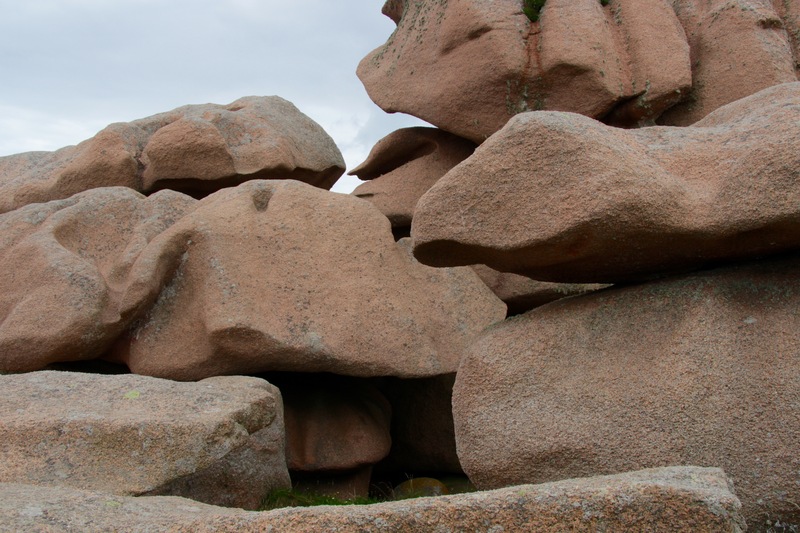 But to see these sea and wind sculpted boulders in their natural state is as breathtaking as it is easy to walk the immaculately maintained trail. 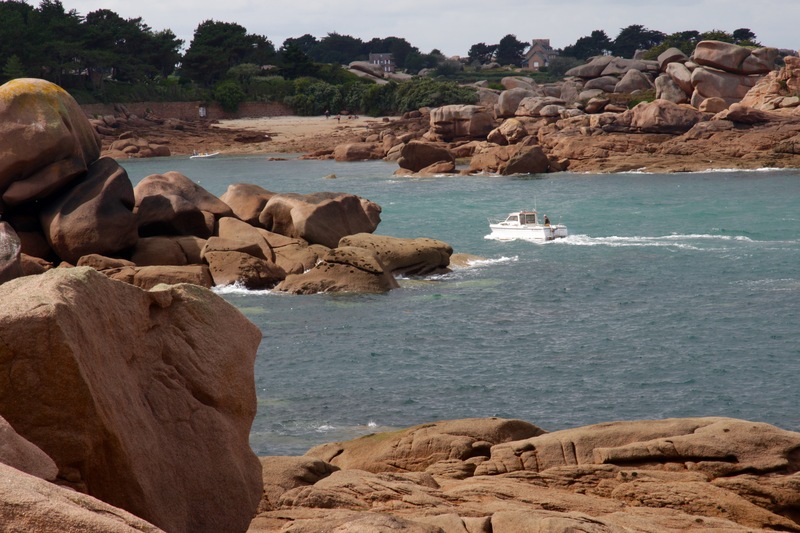 We are in Perros- Guirec, the central town of France’s Côte de Granit Rose. The beauty of the sea and coast is a part of what has drawn us to this holiday destination. 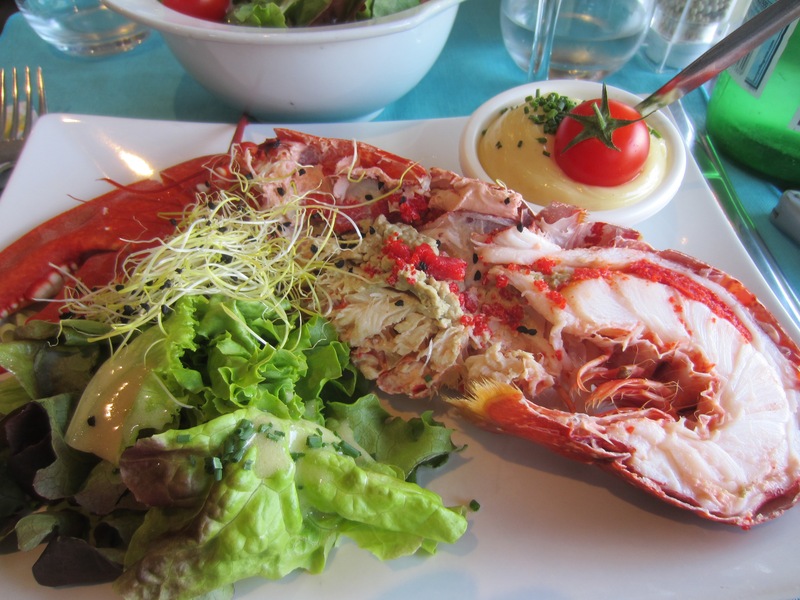 Of course the seafood, elegant 19th century architecture and Perros-Guirec’s proximity to other great destinations in Brittany and Normandy helped in our decision to make the drive. On the west end of town we locate Trestraou Beach and the trail that hugs the coastline. France is criss-crossed by some 37,000 miles of walking paths, called Grandes Randonnées (GR) including the GR34 (Sentier des Douaniers) which follows the Brittany coast for 360 miles. This tiny section is only 4 miles long, but noted for its accessibility and beauty. Our path winds through a jumble of pinkish boulders. There are walkers from many countries, some in groups and others as couples. Most stop as frequently as we do to take pictures and watch the light change on water and stone in the shifting clouds and sun. As we reach our destination, an intimate cove of the village Ploumanac’h, a rain shower darkens the scenery and scatters walkers. Because this is France, there is a grand hotel with a champagne bar. We duck in for cover, order a glass and wait awhile… enjoying this most civilized interruption before heading back on the trail. Wow, what a great trip. You landed well. Have a wonderful time in Rome. Thanks, Terry. We will look for the pasta with pepper and butter at the cafe in Trastevere that you mentioned.